Time management plays a special role in every Social Media Manager’s life for a reason: social media is dreadfully distracting. How often do we forget about the very existence of time and work and deadlines when the infinite News Feed shows up? I might be exaggerating, but to me Social Media Managers are like superheroes: they constantly tame the animal that swallows time like it’s nothing. So how do they do it and how can we mortals get better at it? First, let’s get to the basics of time management. You might’ve seen the matrix before, but it’s always good to recap. As every manager out there, you will have all four of these work types. Surely, you already know that important and urgent tasks should be done straight away, and procrastination is terrible. The trickiest are #2 and #3. 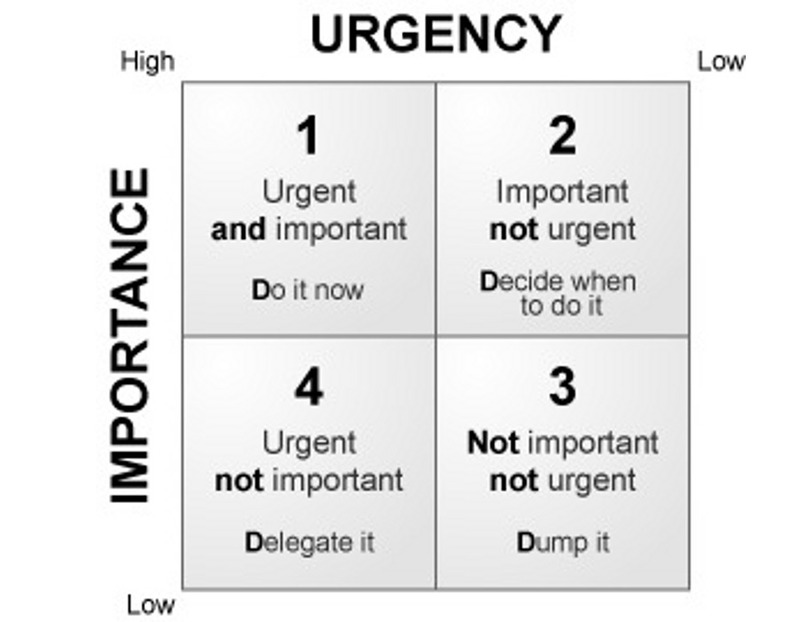 The trap that you can easily fall into is not doing important but not urgent tasks at all. They are usually hard and time-consuming, take up loads of resources that you end up unintentionally spending on something urgent but unimportant. Well, don’t fall into the trap. Delegate the urgent and unimportant tasks, or dump them completely in favour of doing something truly valuable. With social media it’s easy to go with the flow and not have any plan at all. But as you can imagine that’s a faulty approach. As with anything, you need a detailed plan to stick to. Now that you’ve prioritized your tasks, make an actual “to do” list with time slots, keeping your priorities in mind. Having a prioritized “to do” list will make you (or at least should make you) say “no” to activities that provide a false sense of achievement but don’t bring you closer to your goals. Write down what kind of content you will post each day of the week and repeat that each week. Write down the tasks for the following growth for each week. Dedicate specific time slots for engaging with your potential customers. Dedicate regular time slots for reviewing ROI. It’s also often beneficial to “overload” your day. Besides activities that you have to do on your list, make a list of activities that would be good to do. The more you have planned, the more you’re likely to achieve because having a lot to do in a day creates a healthy sense of pressure. You focus better and do everything more efficiently. Know your limits though: if you feel that the quality of your work suffers because you don’t have the time to do it right (or that you suffer from not enough sleep and food), drop some of the “would be nice to have” activities. Now that may be counterintuitive: people that are good at multitasking are always so proud of it! Just look, they can type a blog post while being on the phone with their colleague and on another phone with their mum, and eating a cupcake that’s not even getting dropped on the keyboard. How great is that! But studies show, and yes, there is actual research on that matter, that multitasking only hinders the quality of your work and you end up spending disproportionately more time on each of the tasks. So choose to focus on one task at a time and you will end up happier and more free. 4. Automate what you can. 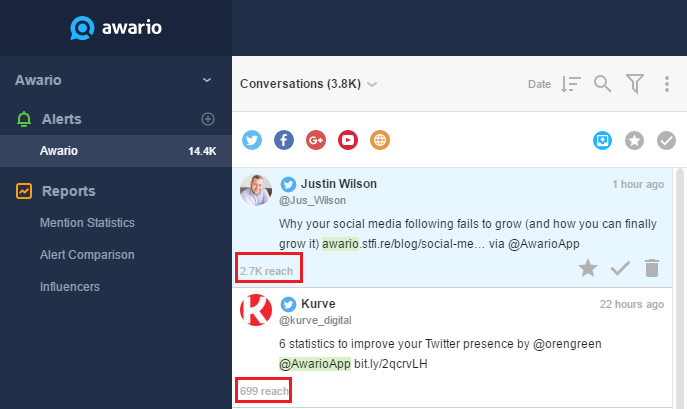 Awario for finding mentions of your brand on social channels and sorting them into important and unimportant ones. Buffer for scheduling your posts and posting them to many social channels at once while you’re not even close to your PC. Crowdfire for growing your social media following through mass following/unfollowing. IFTTT for automating almost anything on your phone. Creating new content is the most resourceful and time-consuming task of a Social Media Manager. Yet most social media posts bring traffic for a couple of days and then get lost in the ocean of other posts. The half-life of a social media post is, unfortunately, miserable on any platform. That means reposting, repurposing, and reusing your made content in every possible way is a must if you want to save time. You can remake your most interesting blog posts as infographics, presentation or even a podcast – all of this will take less than searching for new, similarly engaging content. And coming back to the previous point, you can automate the process and your post will be reshared regularly with no effort from you. 6. Measure what’s working regularly. Measuring ROI with regular intervals will help you find out in time what’s not working and drop the task. For example, if you notice some specific social media platforms aren’t bringing you traffic, it makes sense to stop wasting your time on them. With the sheer number of platforms, it makes sense to try many at first, and then ditch the ones that aren’t bringing any value. The key to saving time as a Social Media Manager is creating a process that is organized, habitual and automated to a large extent. But at the same time you should stay flexible and be able to ditch the schedule when required. Social Media Marketing is about both perfect organization and creativity – not a simple job! So what are your hacks for dealing with the overload and saving time as a Social Media Manager? Please share in the comments!